Many people prefer to use a functional trainer rather than lifting traditional weights. You can save money if you use one of these at home. Functional trainers are sometimes referred to as cable crossover machines or cable gyms. 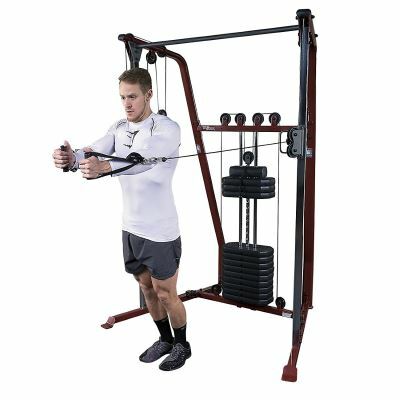 Each of these machines consists of cables which are attached to pulleys, using these it is possible to work out the entire body due to the significant number of exercises that they have to offer. They also feature many adjustment features such as being able to adjust the height and positions of the pulleys. So these are very versatile machines. They are also adjustable when it comes to the weight or resistance. Most functional training gyms have a maximum weight in their stack of between 100lbs-250lbs. 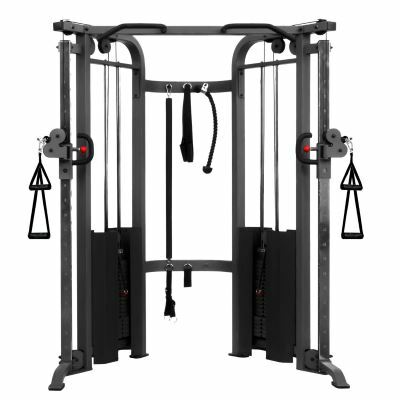 Life Fitness G7 Click For Life Fitness G7 Price An outstanding and super sturdy functional trainer from a well respected manufacturer. Precor FTS Glide Click For Precor Glide Price An great device with with a unique smooth and quiet motion. Bowflex Revolution Click For Bowflex Revolution Price Perfect for the home or where there is limited floor space available. XMark Functional Trainer Click To Check XMark Price On eBay A great solid trainer. We couldn't ask for more. This is simply one of the best functional trainers’s ever made. 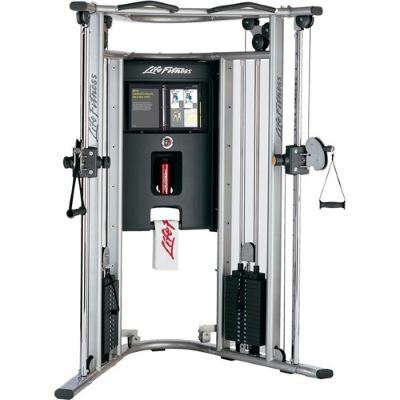 Life fitness is an extremely well-known brand and reputable, especially in the commercial gym industry. If you have ever been to a gym or health club, chances are you’ve used a piece of life fitness equipment already. 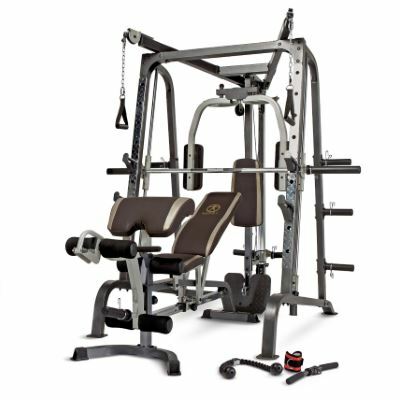 The life fitness G7 is a dual pulley setup which features a wide range of customization with 20 different pulley positions, thus offering great variety in your exercise. It allows its users to perform 55 exercises and the machine also includes a training manual mounted on the machine plus a video guide too. 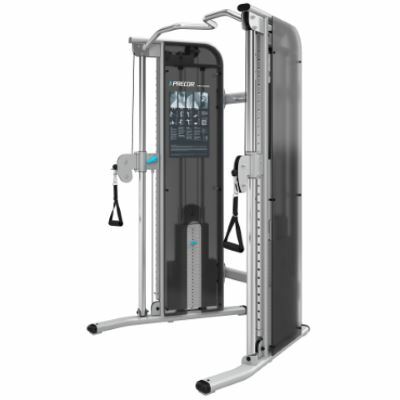 As you expect from life fitness, the cable mechanism is super smooth and it the functional trainer feels sturdy and well built all round during use. The Precor FTS Glide gave us a new appreciation for Precor manufacturing quality and design. It provides a unique super smooth cable motion and such a high level of freedom that anyone who uses it will simply have everything they need. 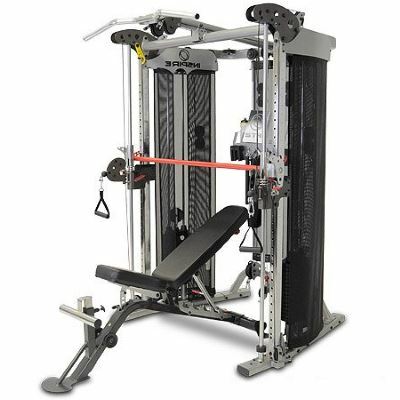 Just by looking at it, you can tell that this is a commercial grade piece of machinery but with a small footprint making it suitable for home and commercial gym use. It can also fit into a corner quite nicely. The motion that the FTS Glide generates is smooth and consistent throughout movements. This is true for both long and short quick movements. The construction quality is 2nd to none with position welds and solid fittings making it a very robust machine. Another interesting thing about the FTS Glide is the pulleys are designed in a way that they are near silent and so you don’t get that cable hissing sounds which you can get with some other functional trainers. At first glance, the Bowflex Revolution doesn’t look like your standard heavy duty functional trainer or even like other Bowflex models, but it is just as capable and is a great looking piece of equipment. With this, you will be able to easily perform over 100 different exercises thanks to the wide range of included accessories. It also comes with a DVD showing all of the exercises that the Bowflex Revolution is capable of. The Bowflex Revolution is extremely compact when compared to other functional trainers. This is thanks to its unique SpiralFlex technology. This SpiralFlex technology and is an innovative type of resistance mechanism developed by Bowflex themselves and provides a smooth resistance of weights up to 300lbs. The Revolution will allow you to perform a full body workout and can also be folded away went it is not in use. The ergonomically designed seat is one of the most comfortable that we have used and the smooth cable mechanism is a refreshing change. As you can see, the XMark comes with all of the accessories that you would expect. It is constructed from a heavy steel covered in a powder coating which is scratch resistant, and the weights are nicely rubber coated rather than just plain old steel. Obviously, this comes in a large package. You can expect eight boxes to be delivered. Fortunately, these boxes are quite light, so one person can carry them upstairs on her own. The time to assemble this piece of equipment is approximately four hours, and all of the tools that you need are provided. The pulley system is the most difficult part of the assembly, but once you understand how it works, it’s quite simple. The XMark is easy to adjust the and provides as much versatility as you would require for any exercise, and the pulley system is very smooth. This, along with the rubber coated weights make this a very nice piece of equipment to use. Marcy has been creating gym equipment since the late 1950s and is well renowned for their innovative and reliable products. The number of exercises that you can perform using this machine is simply astounding. On top of this, there are many other great safety features as well as additional features which are nice to have. For example, it features a place to store your weights and a high-quality pop pin adjustment system. The smith section features Marcy’s ultra glide linear bearing technology which makes for a super smooth movement. The assembly of this is not as easy as some other trainers on our list but it’s worth it for the vast range of exercises you can do with it when it’s built. The downside is that weights aren’t included so you have to source your own. But even after you have got your own weights, it still works out great value for money. Even though we said it before.. We’ll say it again; this is a whole gym in one package. You may even find that you have access to more exercises in this piece of equipment than you would at your local gym. The pulley system on this is very smooth, and we like the option of using free weights or assisted. For example with this, you can choose to perform free bench press or smith machine bench press, and there are many commercial gyms which don’t have this capability. 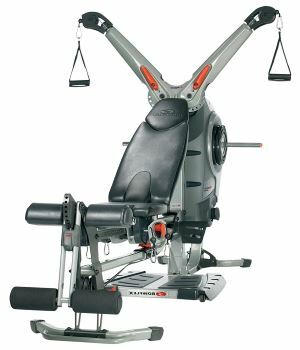 The trainer from Inspire Fitness is a very versatile machine. It allows you to work your entire body with ease. And there are options to add even additional handles and weights to the trainer for even more exercises. Plus, it features an innovative weight multiplier system. This system allows you to quickly double the resistance of a machine by simply adjusting the pulley mechanism. This works great and so you can get 300lbs of resistance from the included 150lbs of weights. The assembly time of this is approximately four hours if you do yourself or two hours for professionals. Once it is set up, it looks beautiful, just like something you would expect to see in a brand-new commercial gym. One thing which could be improved is the padding on the leg press attachment. We found this to be a little too thin so when lifting heavy weights, it can dig into the legs a little. The footprint of this trainer is quite small considering the versatility of it. The pulley system is smooth and quiet making the whole thing a pleasure to use. 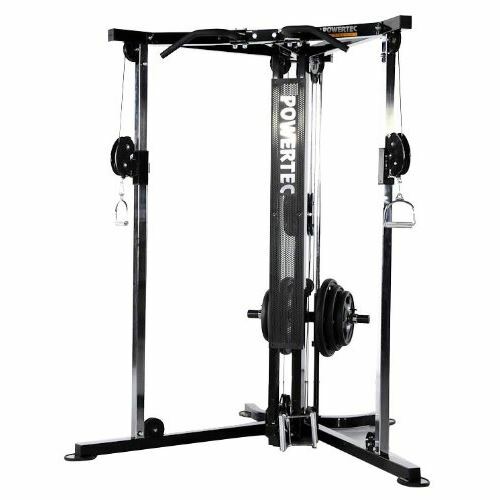 The Powertec functional trainer allows you to do many types of exercises. One thing we particularly like about this machine is the ability to attach a long bar to both of the pulleys. This allows you to do perform curls without the usual twisting motion you sometimes get when a cable is connected as to the middle of the bar. You can also perform squats with this same mechanism. And for leg exercise, we recommend getting the correct lifting shoes. The assembly instructions for the power tech workbench are not the easiest to follow as they do not contain words and only diagrams. However because it is a smaller piece of equipment, it still does not take longer to put together than any of the larger alternatives. So all in all, this is a well-built exercise machine which is compact offering a good selection of equipment. This is actually a mk2 version of the Best Fitness functional trainer. The BFFT10 is the easiest of the workout machines on our list to assemble. There are also videos on YouTube to assist in the process. Once assembled, it is simple to use as there are only ever two handles that you need to grasp. Body Solid call this a “no cable change” design. The pulleys on the BFFT10 swivel 180° allowing you to start your exercise any position you desire. Some may put off by the lack of versatility with this as it just features two cables and a pull-up bar, but these still allow a significant number of exercises to be performed with it. In summary, this is an excellent and affordable machine for those who don’t have a lot of space or require complex cable systems. Maybe you want to work out many areas of your body and it can be difficult to do this without going to the gym. But a functional training machine changes this. Many of these are advertised to allow you to perform around 50 different varieties of exercise, but it’s very easy to do even more if you use your imagination. This is great for the one-time investment that you would make. For example, a professional baseball player may use a one these devices to improve the strength of their swing. With a functional cable machine, they would adjust the pulley so that it is in the middle of the rack at around waist height. Then, while holding the cable handle, they would rotate their body thus working the same muscles that they use when they perform a baseball swing. This will not only improve their swing strength but also creates muscle memory to also assist in their game. Many don’t even realize how many exercises these trainers can provide. It’s worth doing your research to see just how many are available to you. Generally, there are two types of functional trainer. The first is a tower with a single cable which can easily fit into the corner of a room. The second type is a dual cable tower. This takes a little more space and can go against the wall. Most people find that they can fit either of these into their home as neither take up much space. The trainer is a great alternative to free weights as cable exercises are known also to include the use of stabilizing muscles when using a full range of motion exercise. In fact, a functional trainer machine will allow you to do many exercises that are not possible with free weights. For example, cable crossovers or seated row and cable machines are simply the best thing for tricep pull downs. Home gyms should allow a broad range of adjustment. It’s important to make sure that yours also has this functionality for you to maximize the number of exercises that you can perform. You should decide if you want a single or double weight stack. A single stack will only allow you to carry out a limited number exercises. For example, you can’t use cable crossovers on both sides of the body at the same time with a single stack. Two separate weight stacks are required for you to work your body without any imbalance. It’s also important to check that the machine has enough weight so that you have plenty of room for progression. This will allow you to progress as you increase the weight which you use on your trainer. Ideally, you would want your home gym to allow you to walk away from it while holding a cable. This will allow you to do even more exercises such as power lunges or weighted sprints. You should read functional trainer reviews to ensure that’s one you purchase has a smooth action. The nothing worse than pulling a cable with resistance that does not feel smooth. You won’t enjoy using your trainer if you find it difficult to adjust the weights or pulleys. If you don’t enjoy it then it’s possible that you will use it less. Also having a functional training gym that is easy to use, it will make your workouts quicker and more efficient as you will not need to be taking long pauses to adjust the machine. The best functional trainers will have extra appendages included allowing you to do even more exercises within your home gym. A good example of this is a chin up bar. If you have a chin up bar on your trainer, then there are a good number of exercises that will be included with your training machine per free. Functional training equipment is perfect for professional gyms and home gyms. They are very easy to use and comfortable at the same time. These machines come highly recommended and a great investment as they should allow you to work out on them for a lifetime.